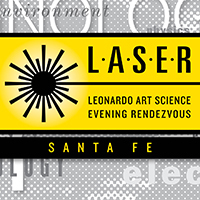 LASER (Leonardo Art Science Evening Rendezvous) is Leonardo/ISAST’s international program of evening gatherings that brings artists and scientists together for informal presentations and conversations. More information. Featuring pioneers of holography and Santa Fe residents Fred Unterseher and Rebecca Deem. Biographies are written and published by Currents New Media. Time: Doors open 6:30 p.m., Talks start at 7 p.m.